USMTO Athletes & Coaches: The 2019 West Crew gets FREE ADMISSION! DEALS FOR PARENTS AND FANS!!! Donate as little as 6 hours and get free admission to the 2019 U.S. Muaythai Open West Championships that will take place from April 25-28, 2019, all while supporting and helping grow the sport of Muaythai in the USA! Shift end-times may change depending on the number of competitors. We encourage you to sign up for as many slots/shifts as possible and pass the word along. 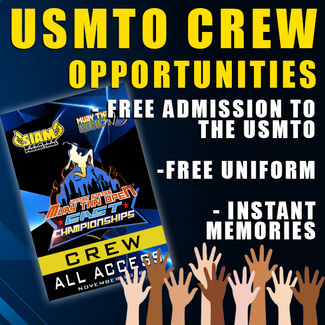 All crew members will receive free admission to the event, a USMTO crew t-shirt, free meals, and most importantly, an unforgettable experience.